In response to a recent surge in Muslim tourists, a major halal-themed international expo will be held in Chiba Prefecture in November. Titled Japan Halal Expo 2014, the two-day event in the Makuhari Messe convention center in the city of Chiba, will essentially seek to boost public awareness of halal fare, enlighten visitors on the latest market trends surrounding Muslim tourists and allow Japan-based Muslims to give feedback on whether this is a Muslim-friendly nation. The number of tourists from Muslim-majority countries rose sharply last year thanks to drastic visa relaxations, including a visa waiver and a longer-term stay, targeting a group of Southeast Asian countries. Around 176,500 tourists came from Malaysia in 2013, up 35.6 percent from a year earlier, while those from Indonesia reached 136,800, up 34.8 percent, according to data from the Japan National Tourist Organization. In response to the surge, major airports such as Narita International Airport are scrambling to make Muslim tourists feel welcome, including by setting up prayer rooms and offering in-flight meals free of pork and alcohol. Still, efforts to make Japan more Muslim-friendly remain fundamentally inadequate, said chief organizer Yoshichika Terasawa, executive managing director of Makuhari Messe. Hj Burhanuddin Md Radzi, the expo’s co-organizer and president of the Malaysian animation production company Les’ Copaque Production Sdn Bhd, agrees. In the eyes of Muslim tourists, he said, the number of halal-certified restaurants in Tokyo remains unfortunately low. 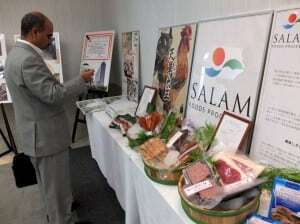 But he nonetheless emphasized that Japan has the potential to become a major player in the halal market. Japanese people, he said, have a positive affinity with halal foods, mostly because their well-maintained sense of public hygiene aligns very well with the idea of cleanness that is at the crux of halal foods. “I don’t think it will be much difficult for Japanese restaurants to learn how to make their meals halal-certified,” he said. “Take Tokyo Banana, for example,” Radzi continued, referring to the famous souvenir sweet. The expo is scheduled for Nov. 26 and 27.